Since its explosion in the late 1990s, it’s hard to ignore the increasing visibility of craft in contemporary art. In her new anthology Extra/Ordinary: Craft and Contemporary Art, Maria Elena Buszerk collects 14 essays and one interview to discuss the role of craft in today’s art world. The book is divided into four sections: Redefining Craft: New Theory; Craft Show: In The Realm of “Fine Art”; Craftivism; and New Functions, New Frontiers. To me the title doesn’t quite describe the contents. I might have subtitled this book something like Contemporary Craft as Fine Art, which is really what each discussion drills down to. In what is probably my favorite essay, “Rebellious Doilies and Subversive Stitches, Writing a Craftivist History,” Kirsty Robertson talks about the use of craft in contemporary protest, specifically knitting. “Radical knitters and Stitch and Bitchers,” people who have a “sophisticated understanding that the making of any textile is connected to the capitalist system,” are the focus of much of her discussion. In her examples, she cites artists who employ the knitting as both an act of protest and fine art. The cover of Extra/Ordinary shows Pink M.24 by Marianne Jorgensen with the Cast Off Knitters. In this collaborative work, the knitters created a giant tea cozy fit to a tank. The image of the cold, hard, masculine tank of war wrapped in the warm, soft, feminine pink of the cozy is startling and effective. Extra/Ordinary concludes with an interview of Margaret Wertheim, the founder of the Institute for Figuring, which (among other things) teaches about the intersections of art, science, nature, and craft. You might know her work with her sister Christine from The Crochet the Reef Project. 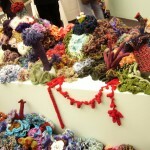 Exhibited at the Chicago Cultural Center in 2007, The Crochet the Reef project asked artists and crafters to demonstrate hyperbolic space through crocheting of sea forms and coral. Before reading this book, I thought of Wertheim only as a scientist. Okay maybe a scientist, who likes to crochet, still I did not have an image of her as an artist or craftsperson. The interview changed my ideas about her work and the relationship between art and science. Certainly this book will appeal to those who work seriously in craft, and perhaps fiber artists in general as this is the focus of most of the writers. But the surprise in Extra/Ordinary is the stitching together of what had seemed to be disparate ideas: contemporary art, craft, womenâ€™s work, capitalism, protest, and gender. Ultimately all of the essays discuss these ideas. I recommend this book. Itâ€™s nicely illustrated as well. Terri Griffith has published fiction and criticism in Art21, Bloom, Suspect Thoughts, and BUST, as well as in the anthologies Without a Net: The Female Experience of Growing Up Working Class (Seal Press, 2003), Are We Feeling Better Yet? (Penultimate Press, 2008), and Art from Art (Modernist Press, 2011). Since 2006, she has been a literary and culture blogger for Bad at Sports. Griffith is the author of the novel So Much Better (Green Lantern Press, 2009) and the co-editor of The Essential New Art Examiner (Northern Illinois University Press, 2012). She teaches writing and literature at the School of the Art Institute of Chicago.